Hart and Cranston co-star in STX Films and Lantern Entertainment’s “The Upside,” one of the three movies opening nationwide on Friday that will have to compete with reigning box office champ, “Aquaman.” And unless a new title (the other two releases being Sony’s “A Dog’s Way Home” and Entertainment Studios’ “Replica”) pulls off a surprise, it looks like the King of the Seven Seas will rule yet again. Warner Bros.’ comic-book tentpole “Aquaman” — starring Jason Momoa and directed by James Wan — has generated over $943 million worldwide and is well on its way to crossing the $1 billion mark. 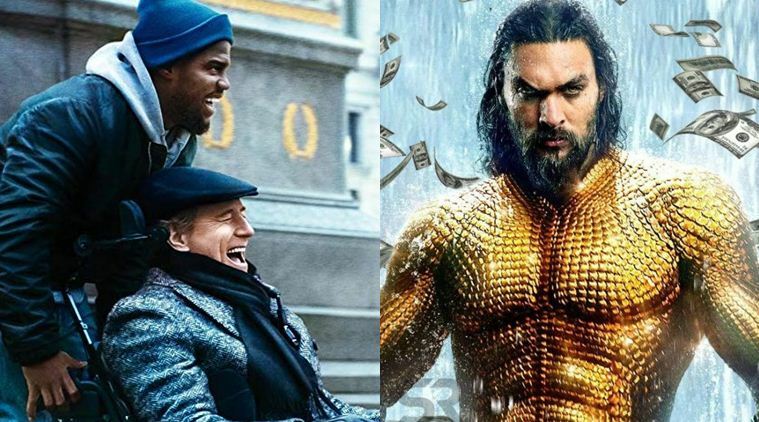 If the aquatic blockbuster sees a similar decline to last weekend, it could add another $15 million to $18 million domestically in its fourth week of release. “Aquaman” has earned a solid $259 million in the States, but overseas is where the real cash is flowing. With an international bounty of $683 million, Arthur Curry and his Atlantean cohorts shattered the previous record — set by “The Dark Knight Rises” with $636 million — for DC’s highest-grossing title abroad. Does all this mean Warner Bros. has finally figured out how to deliver a worthy rival to Marvel’s seemingly impenetrable empire? At the very least, it’s a good sign for the studio, who spent over $200 million before marketing costs, to create the underwater world in “Aquaman.” Its commercial success couldn’t come at a better time for the Burbank company. Warner Bros. proved it could crank out a hit with “Wonder Woman,” the box office sensation that also became a cultural touchstone. But Diana Prince’s lasso of truth didn’t mean fans forgot about reviled entries such as “Justice League” and “Batman v Superman: Dawn of Justice.” Perhaps finally, “Aquaman” signals that the DC Extended Universe can have a life of its own without its flashier members of the Justice League like Ben Affleck’s Batman or Henry Cavill’s Superman. For audiences looking to watch something other than Spandexed heroes, “The Upside” and “A Dog’s Way Home” will likely vie for second place. Each film is estimated to bring in between $8 million and $12 million during the three-day stretch. Hart and Cranston are channeling a little feel-good energy with “The Upside,” a comedic drama that will drop in 3,080 venues. It’s based on the true story of a quadriplegic billionaire who befriends a recently paroled convict hired to help him. Neil Burger, the director of 2011’s “Limitless” with Bradley Cooper, helmed “The Upside,” based on the 2011 French hit “Les Intouchables.” The English version had a rocky path since debuting at 2017’s Toronto International Film Festival. The Weinstein Company was originally on board to distribute “The Upside,” but STX and Lantern bought the rights after the project was shelved following Harvey Weinstein’s sexual assault allegations. Hart has been in the headlines over the past few weeks — and not for the movie’s iffy reviews. The comedian was tapped to host the Oscars, but stepped down when controversy sparked over homophobic jokes he made years ago. Sony, meanwhile, is catering to moviegoers hankering for a good cry when “A Dog’s Way Home” hits 3,090 theaters. Ashley Judd and Edward James Olmos star in the family film about a dog who travels hundreds of miles to reconnect with her owner after getting separated. The PG adventure, based on a book by W. Bruce Cameron, cost $18 million to produce. That leaves “Replicas,” a sci-fi thriller about a neuroscientist who tampers with law and science to bring back his family members after they die in a car crash. Keanu Reeves and Thomas Middleditch lead the film that is projected to bring in $4 million to $7 million when it launches on 2,500 screens. “The Tourist” and “The Day After Tomorrow” filmmaker Jeffrey Nachmanoff directed “Replicas,” which has already earned $3.5 million overseas. Elsewhere in theaters, Hollywood will see just how big of an impact a few Golden Globe statues will have on moviegoers. Will audiences flock to “Bohemian Rhapsody” and “Green Book,” the two big winners during this year’s awards show? Fox’s Queen biopic “Bohemian Rhapsody” is already a certified box office smash with over $743 million in ticket sales globally, but the trophy for Rami Malek’s portrayal of legendary frontman Freddie Mercury could drum up even more hype. It’s still playing in over 1,000 domestic venues and saw a boost in sales last weekend, amassing another $2.3 million during its 10th week of release. Universal’s “Green Book,” a drama about the friendship between a black concert pianist and a white driver, could use the awards attention. Viggo Mortensen and Mahershala Ali co-star in the film, which has generated a lackluster $36 million worldwide, a middling result for a movie that carries a $23 million price tag. Otherwise, things should pick up again on the box office front when “Glass” opens during Martin Luther King Jr. weekend. M. Night Shyamalan’s gruesome thriller is expected to debut with $50 million to $70 million. Talk about scary-good.